Providing an environment that awakens students curiosity - because without curiosity no questions and wonderings, without questions and wonderings no inquiry. Helping students acquire the information literacy skills they need as inquirers, e.g. how to go about inquiry, how to formulate questions, how to search for information, how to evaluate the sources and use them ethically, etc. Supporting teachers and students with resources in different formats - print, electronic, primary and secondary sources, experts! Now I could take this one step further by asking, how do I put this into practice? How do I get students to get curios? Visually appealing nonfiction books - visual encyclopedia on animals, space, weird stuff are a hit. I don't have much yet but ordered some exciting titles for next year! Artifacts to explore - I don't have much yet but I have a basket with items from Ghana on my desk, a Hong Kong box (includes books, flyers, maps etc.) and "Ms. Tanja's box of little things"
How do I help students to acquire the skills they need as inquirers? How do I support teachers and students with resources? 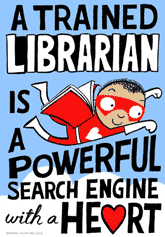 Compiling and providing access to online resources (see HKA Primary Library Online Resources). Thanks so much for this post. I've been considering a lot lately how to better utilize our library and media resources. Check out what's happening in my library! Primary School Librarian working in the PYP - life-long learner, passionate reader, wanna-be geek and writer.